Home→Ro Khanna→Ro Khanna for Congress!!!!!!! Some people might wonder why an old lady progressive like me would be supporting the likes of Ro Khanna. After all, he is young, vibrant, and probably never sang a verse of “Kumbaya” in his life. Ro Khanna teaches economics at Stanford. That gives him a strong, up-to-date understanding of the present. He understands what we need to keep our economy strong. Honest. I’ve met him. We talked. Ro Khanna teaches law at Santa Clara University. I don’t know about you, but I really DO think that someone in any legislature should have some experience in law. If you are going to write laws, you should understand the legal process. I am NOT saying that all Congresspeople should be lawyers, but I am saying knowledge of the law is a plus. Ro Khanna Wants to Reform Congressional Pensions. I do not think that those that make their money as taxpayer employees should get a better pension plan than the taxpayer does. If you want good pensions for politicians, you need to elect people who will insure that those in the private sector ALSO have decent pensions. I got news for you dudes and dudettes in Congress and the Senate, if you can’t write and pass laws that make private enterprise pay for decent pensions for their retirees, i.e. taxpayers, why should the retiree/taxpayer pay for you to have a pension at all? You do not deserve any more than you are able to legislate for ALL Americans. And, until EVERY American has a good pension, in addition to his/her social security, from their employer you do not deserve one, either. Hey, all you baby boomers out there, remember how HARD we fought to get the “older generation” to listen to us? How hard we fought to vote at 18, hold office, and have our voice heard? Well, it is time we all put our money where our mouth is and supported a young person for Congress. It really is their turn. Fair is fair. We rejoiced when young men of thirty went to the Senate and House in the ’70’s. Guys named Biden, Kerry and Harkin, as I recall. They are all still there, serving in some way. That’s great! But we also need to make some room for some younger people. The only young faces we have in Congress all wear red. The Cantors, the Ryans, etc., etc., etc. Young people need someone they can identify with, and the Democrats have no-one I can think of at the moment. If we do not give them some representation in Congress, we will lose them to another party. Period. It will happen. It might not be to the GOP, but we will lose them. The Democratic Club that I belong to held a forum for all the Democratic candidates. The sitting congressman was not in attendance. I was told he was in town, not in Washington. He sent a video, but he didn’t show to debate the other candidates. Frankly, I do not care what his excuse is, you show for debates and forums or you do not get my vote. We Live in Silicon Valley. This is the last reason I will give for now. 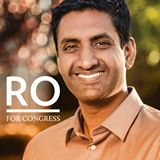 And, it is the biggest reason I have for supporting Ro Khanna for Congress. Our sitting Congressperson has a background in education. He was a teacher and a high school principal. COOL! That’s a great thing and necessary to have some people in Congress with that kind of a background. But, um, forgive me, but, we LIVE IN SILICON VALLEY. You know, where there is a lot of COMMERCE. And, the guy that has the background to best represent this district is the guy who served in the Commerce Department and teaches economics. That would be Ro Khanna. That does not mean I want to throw my existing Congressperson under the bus or be disrespectful of his service. It means I recognize that in Silicon Valley we will be better served by someone who has experience in commerce then education. Oh, by-the-way, did I mention that Mr. Khanna TEACHES at Stanford and Santa Clara University? So, it isn’t like we have to give up someone with education experience to get someone with commerce experience. We can, in this case, actually have both. Really. Honest. We can have it all. But, judge for yourself. Follow him on Twitter at @RoKhannaUSA, see his Facebook page at www.facebook.com/RoKhannaUSA and visit his web site at rokanna.com.